Prices for sails to your Allied Seawind 32 sailboat. Resen Sails. Here you can find prices for new sails and lazyjack/lazybag for your Allied Seawind 32. 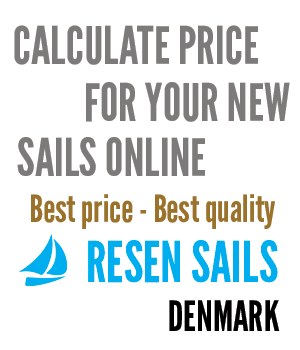 Resen Sails delivers high quality sails at the best prices in the whole of Europe. Information about our sails. Below you will also find prices for lazyjack/lazybag to your Allied Seawind 32. The sail prices are calculated automatically from the data we have for the Allied Seawind 32. Therefore the sizes of the sails can vary a little from ex. class rules or the measures of your old sails. This is only marginal and we don't sew without getting the actual measures (from you). The sails are sewed using measures from exactly your boat and according to your wishes. We need the measures from you. We deliver directly to your private address with GLS Business Parcel. If you want another size or configuration, please use our sail price calculator. Standard battens, 2 reef, cunningham, mast-slides, trimline on leech, sailnumber, ticklers/telltales, loose foot or rope on foot and sailbag. UV-protection in optional color, trimline on leech, rope for furler-system, ticklers/telltales and sailbag. Piston hanks in brass, ticklers and sailbag. When you order new sails for your Allied Seawind 32, you should be aware that the measures we have are not necessarily the same measures, that will fit into your boat. You'll have to measure your old sails or rig. This is easy if you use our guide. See our measuring guide here. All prices include everything, also VAT, but not shipping. The drawings are indicative and are not in real scale. What do customers say about our sails?